DB Sports Tours doesn’t just pride ourselves as Ireland’s best sports tours operator, but also as an agency for young Irish footballers. Ahead of the new campaign in England many of our players are beginning preparations for another long and hard season. DB Sports Tours have a host of players plying their trade in England, looking to forge careers in the game. We are associated with the likes of Adam McDonnell, Noe Baba, Anto Dolan, Anto Breslin, Zac Elbouzedi, Jay Lunney, Zac Elbouzedi, Darragh Leahy, Daniel Mandroui and Northern Ireland International Dylan Davidson to name too name but a few. Adam McDonnell, who plays for Ipswich is particularly enjoying a prosperous pre-season. Having joined up with the first team as they prepare for another assault on the Championship, Ipswich are spending time in Ireland and Germany during July. Ipswich played Shelbourne on Saturday at the iconic TolkaPark, winning 6-0 on the day. McDonnell was quick to impress, bagging an assist after just 52 seconds of play. McDonnell will continue with Ipswich’s first team for pre-season where they’ll take on European sides such as Fortuna Dusseldorf and FC Utrecht. Elsewhere the likes of Noe Baba continues to go on trial at a host of Championship clubs, where he may meet more DB Sports Tours playing their trade in England’s notoriously difficult second tier. He may meet Anto Dolan at Fulham whose having a fantastic pre-season after being re-united with his old coach Steve Whigley after returning from Nottingham Forrest, or Jay Lunney and Dylan Davidson at newly promoted Preston. There’s Darragh Leahy, who last season signed a two year deal at Coventry City, enjoying a fantastic pre-season where his physique has a seen a massive development over the summer months. Trevor Clarke meanwhile will be looking to get back to the UK once his broken foot which he injured in the Euro finals is back to full fitness. Anto Breslin is enjoying a tough pre-season at Wolves with Scott Sellars now is his 21’s manager. Scott was responsible for restructuring Manchester City’s academy which is now one of the top academies in Europe. Zac Elbouzedi will be hopeful of doing similar at Premier League outfit West Brom as he hopes to be involved with the reserves at the end of the month heading to France. 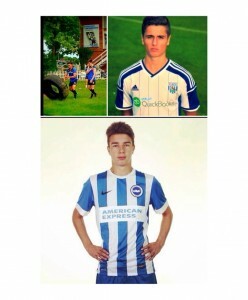 Daniel Mandroui at Brighton is currently enjoying the Iberian competition as he played SC Braga this week getting voted man of the match by his Portuguese opponents. All of these young starlets are enjoying their tough pre-season schedule’s so far and here at DB Sports Tours we’d like to wish them the best of luck for the new season.